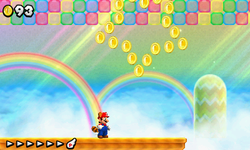 World Star - Rainbow is the final Rainbow Course in New Super Mario Bros. 2, and is the Rainbow course featured in World Star. To access this level, the timer must end with the two digits '99' (that is, 'x99', where 'x' can be any number) when the player reaches the flagpole of any World Star level. Once this level is completed, it can be accessed again by satisfying the above condition once more. The stage begins on a flat, green area with a star pattern in the background, a Pipe Cannon in the center of the area. Entering the Pipe Cannon causes two lines of coins to gradually appear before the player is blasted into the sky. Mario is launched onto a moving platform. He encounters three star-shaped Coin formations, then many 10 Gold Coins and a Giant Coin fall toward him. He then passes a large Coin Roulette Block and a Red Ring, each enclosed in Coins forming a star shape. Collecting all 8 parachuting Red Coins replaces the player's inventory with a Gold Flower. The level then ends with three more star-shaped Coin formations. This page was last edited on April 6, 2019, at 00:52.